Somebody asked me this question when I commented on an article by Arianna Huffington on chronotypes. Chronotypes means that we are NIGHT OWLS or LARKS. Dr. Michael Breus names four chronotypes: DOLPHIN, LION, BEAR and WOLF. It basically means is that we all have a natural desire to wake up at different times of the day and some of us are just more productive at the beginning of the day, whereas others are more productive during or towards the end of the day. So what does the weekend have to do with this? A lot of us are CHRONICALLY sleep deprived, ESPECIALLY TEENAGERS. Teenagers are notoriously sleep deprived, because their CIRCADIAN RHYTHM or BIOLOGICAL INTERNAL CLOCK SHIFTS, so that they are MORE ACTIVE IN THE EVENING RATHER THAN IN THE MORNING, but then school starts in the morning and so very often they are chronically sleep deprived. But so are many of us! We just steal a little bit of time here, a little bit there; get up a little bit too early, because we went out too late or went to bed too late OR we are just in complete, constant jet lag, because our natural biological clock will tell us that we would actually be sleeping 'til 8, 9, or even 10 am and then start the day and go to bed later. But because of social obligations, like work or having to bring our children to school, we have to get up earlier. 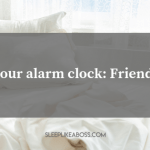 When we do that, we accumulate something called SLEEP DEBT. Sleep debt, you can imagine as, US HAVING A BACKPACK IN THE MORNING AND WHEN WE HAD A GOOD NIGHT SLEEP, THAT BACKPACK IS EMPTY AND AS WE GO THROUGH THE DAY, WE PUT BRICKS IN THAT BACKPACK. WHEN WE SLEEP WE EMPTY THE BACKPACK. Now, if we don't sleep enough, we wake up and we already have a few bricks in the backpack. Obviously the additional bricks during the day, keep piling up and it makes us more and more tired. Unfortunately, it also carries a lot of HEALTH CONSEQUENCES. We are not able to repair different things in our body. We are not able to balance our hormones. Many different things happen, but I don't want to scare you with them now. 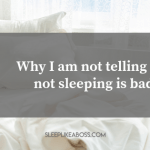 What is important to know, is that WE CAN CATCH UP ON SLEEP DEBT and that happens a lot of the time OVER THE WEEKEND, when we just sleep in and we basically CATCH UP ON SLEEP and we empty out all the bricks of our backpack, so that we are back at zero. Here's the thing: IT’S GOOD TO GO BACK TO ZERO. It's absolutely fine to get rid of those extra bricks! However, at the same time, if you consistently sleep a lot longer over the weekend, you are basically living in a CHRONIC, SOCIAL JET LAG. Your body suddenly gets used to another time and then it has to jump back into getting up earlier again on Monday, which becomes MORE AND MORE DIFFICULT TO DO the longer you sleep over the weekend. That is obviously not to be recommended. 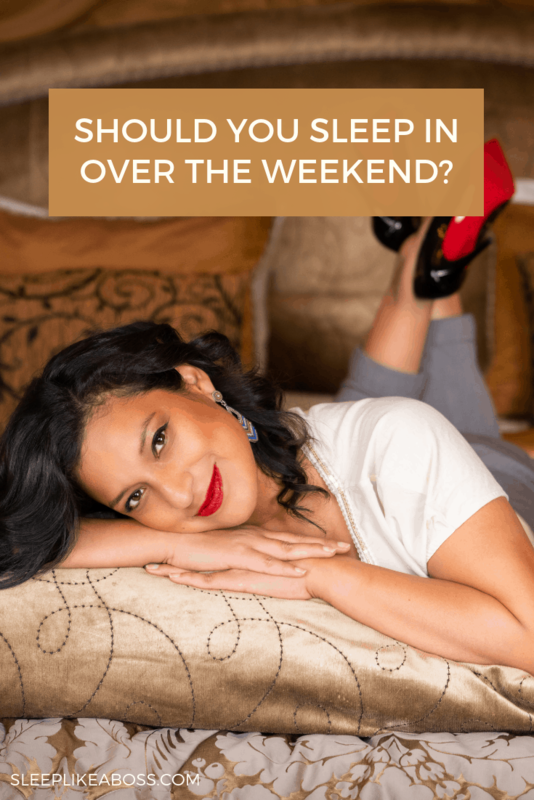 Here's my tip for you: IF YOU DO SLEEP LONGER OVER THE WEEKEND, I would suggest that it's IDEALLY ONLY AN HOUR MORE. Take that hour, but then get up! You will notice that if you get up at the same time everyday, YOUR BODY WILL AUTOMATICALLY WAKE UP AROUND THAT TIME after a certain time. For me, it's 6:00 a.m. at the moment. I'm not a morning person, but, I do wake up now at a quarter to six. Just because I'm used to it, It doesn't mean that I'm more chirpy and bright eyed and bushy tailed at all. That's just what's happening now. So over the weekend, I do sleep an hour longer. It might be that I'm dozing longer. What I would suggest you do instead of having that massive three to four hour sleep in on Saturdays and Sundays, is to SNEAK IN A LITTLE NAP DURING THE DAY, because a 20 minute nap during the day, is going to get rid of a brick as well. YOU DON’T NEED A COMPLETE SLEEP CYCLE (90 minutes). A nap doesn't necessarily mean that you need to sleep. It can also mean that you just have A GOOD REST. Put on your noise canceling headphones, a sleep mask and just sit down somewhere, rest and switch off. 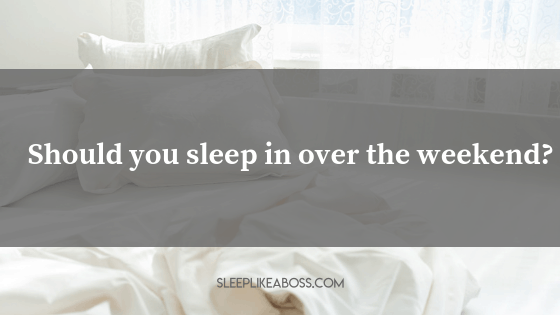 It's going to help you with your sleep debt as well. I hope today’s tip has been helpful. Let me know if there's anything else you would like me to talk about. I always think you might know everything and obviously that is not always true! So, let me know what kind of topic you want me to cover next and I'd be happy to do so.